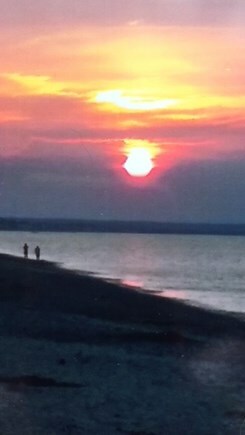 Sunset on our beach . Beach: You're directly on a gorgeous, private beach! The Nautilus is an expansive, 8-room home with central air-conditioning that sits on a sand dune overlooking the ocean and a private barrier beach. Our pristine beach is breathtaking in its beauty. A 10' x 30' upper sundeck offers a panoramic view of both the ocean and beach. Expansive lower sundeck outside kitchen door. Ocean views from most every room in the house. 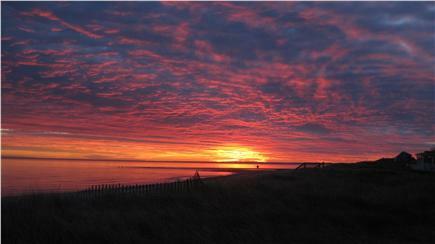 A wildlife conservation area borders our beach. The Nautilus has been recently remodeled. Everything in the house is brand new, modern and in excellant condition. 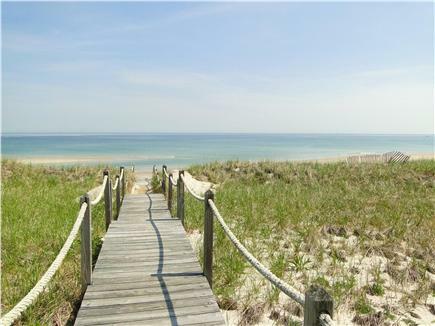 This is the ultimate summer beach house, which is located in one of the most beautiful, unspoiled,and historic areas of Cape Cod.All Cape attractions are within a short driving distance away. 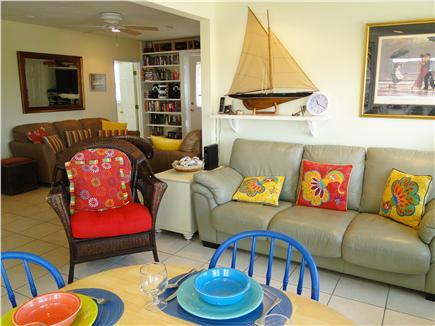 The Nautilus is a wonderful, fully equipped, family vacation house. Our beach is perfect for swimming, boating and fishing. Great golf courses located nearby. Memorable family vacations are our specialty! Our house is located in the King's Highway Historical district of Cape Cod; an area known for its beauty and olde Cape Cod atmosphere. Nearest beach: You're directly on a gorgeous, private beach! Additional pricing info: State and local taxes 12.45%. No tax for weeks prior to July 1, 2019, State and local taxes of 12.45% will apply. Two first floor bedrooms. First floor full bathroom. Everything about this rental property was excellent. Lee stayed in touch by email and the one issue we had with the air conditioner upstairs was immediately fixed on the same day. The dining space fit 11 people and the kitchen had all the things we needed to dine at home as a family. The large table allowed for hours of card and domino games away from our cell phones. The air conditioner downstairs cooled the entire 1st floor which we needed in this week of heat and high humidity. We rented all the towels and linens from the company suggested by Lee and that was awesome as well. Elly and her family were wonderful people to have at our beach house, The Nautilus. We have been so fortunate to have people like Elly reserve our house for their family vacations. They all knew how to relax, wind down and enjoy being together. I hope that Elly will return again, in the near distant future. Wonderful home on the beach! This is a lovely home. It is steps from the beach, and on cooler days you can sit in the comfy second floor room with a perfect view of the waves on the beach. The house is clean, well-equipped, and in a great location. I recommend this rental house. 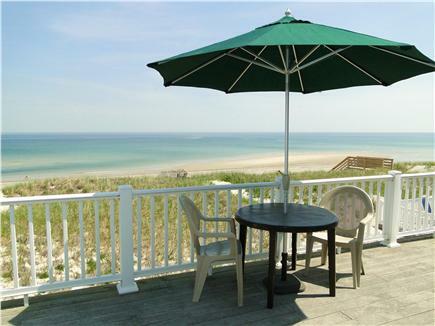 If you are looking for the ideal place to stay in Cape Cod then look no further. You must stay at The Nautilus! This fabulous beach house is perfect for several families to stay. With its loaded amenities, breath taking views and private beach The Natilus was a great place for our families to stay. 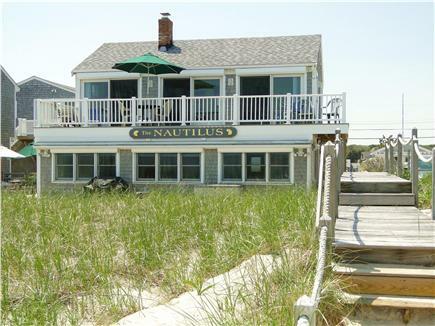 We will call the Nautilus our home away from home there at The Cape. We can't wait to go back!! "Oh what wonderful memories we have made at the Nautilus on Cape Cod in the past 20 years. This year our family included my husband's 89 year old mother and our 2 year old grandson as well as our daughter and our two adult sons with autism. There is a space for everyone in "our" beach house, wonderful views, and the sound of the waves to calm us during the day and lull us to sleep at night. Thank you for making our Cape Cod vacations such an important part of this Kansas family's life."